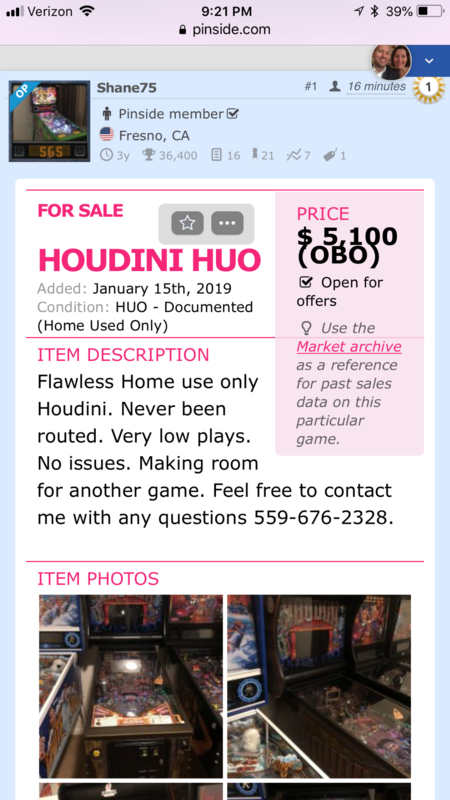 » Forum » All Pinball » Houdini: Why so many for sale? » Houdini: Why so many for sale? Houdini: Why so many for sale? There are 70 posts in this topic. You are on page 1 of 2. Just curious, not trying to start an argument. I’ve played it several items, left with the thought that it’s a fairly tough game due to tight shots, nice animations, beautiful machine. Since it seems to be on the more difficult side, I’d think that was a better long term fit for home use. What say you? Because they didn’t build a white wood and the shots are too tough for most. Combined with trunk shot being inconsistent and requiring a replacement power supply for many it has been quick to be listed by many. If you aren’t great at pinball it’s just not fun. because one man can only take so much rejection on one date, then he must move on. There are more dialed in forsale than Houdini actually. What does that say about Dialed In? And FYI, this will start an argument plus almost positive there is another thread on this exact topic. It’s a great game. As an average player, I don’t think the shots are any tighter than other games. People said the same about TZ when it came out fwiw. Like all games. With the new games that came out since Houdini, and new pins coming this year. Many people sell a game because they need room or need money to get a new game. Doesn't have any bearing on if a game is good or bad. Just their own personal opinion that they want something else. Because we live in a Fast food instant gratification generation. Houdini is a masterpiece that will take time to appreciate. In 10 years this game will be on most wanted list. Because it’s a recent game that a lot of people bought NIB and now they want the next new one. Nothing to see here, move on. Of course more dialed in for sale they sold 3x /4x as many to begin with and it’s been out longer. Houdini owners just want to share the love! Why so many for sale? "Clearly you have no skill"
Love every game we play on my brother's Houdini. Yeah, it's hard. But for me, that's what makes it fun. Just curious, not trying to start an argument. See my innocent, thought-provoking, not-supposed-to-start-an-argument posts "Why are Stern games so poorly built," and "JJP Buyers: what makes them so smart?" To answer your question, the reason is probably because of secret news of a vault edition and they want to get out while they can. Houdini has a few tighter-than-average shots. Some weaker players struggle with those shots and instead of being motivated to improve they sell the pin. Some go as far as to blame the pin for their lack of aim by saying the geometry is broken. Probably best those types get a Monster Bash instead. Maybe Ericpinballfan is onto something with his instant gratification generation remark. Personally, I really enjoy pins with some extra-challenging shots, including Houdini. Who wants a pin with no challenge, where Grandma can step up and roll the thing? Apparently lots of people. Think about which you camp fall into and choose accordingly. This seems to be a rather new issue. Some new players become upset when they flip a ball and it doesn't register some target. Somehow that is seen as an issue with the game, not their poor play. I guess this thread is all about bashing Houdini. I measured the lane width in Houdini and compared them to several other games. Well if we think about the market of home use and people who will play on location and exclude the pros from it that means that 90%(rough estimate) of people who will flip a pin are terrible (like me) but still enjoy flipping. So if a game is not designed to make things happen for that 90% then that 90% will not play it on route and those that buy it and fall into that category will also sell it. This game is probably a lot of fun for people that are fantastic at pinball, but the vast majority of people are not great at pinball nor will they ever be great. Good point, but there are some neat things that even beginners can easily trigger, like Seance multiball, or starting a stage act. Then there's other things, like locking 3 balls in the trunk, which definitely require some skill. Just a bit sad to see so many who would rather dump it than stick with it as they improve. On the other hand if one finds it to be truly un-fun regardless then they should dump it. I can tell you that I dumped mine after two weeks... when you have multiple pins and limited time to play them... you just say screw it and would rather go play something that is "fun" for you and lets you improve. Anything you play will let you improve some games just are more to your skill and will be more enjoyable learning on. I bought a used Houdini from a guy that only had three pins and had to sell a pin to make room for a new one. I would guess a lot of people are in that situation. I have a whole lot more room and rarely sell pins. I would add that my wife and I love Houdini. For me I sold because I went against my gut and thought the theme could grow on me. It did not. Im a Houdini owner. I love that the game is so target rich but do think a second ramp would have been better than the trunk. I absolutely agree if it doesn't grab you, dump it. I can play these at the barcade. Theme is a big issue. When I buy one for my home it really has to grab me. I cant put a finger on it as to why, just some do and many dont. I guess it's a very personal thing. It's really great there are so many offerings these days, something for everyone. It a great time for pinball ! I also like that it's harder to load it up, otherwise it would be going off nonstop for me lol. That's the best answer, I respect that. IMO Houdini fans don't help the game. All this "you're not a real man if you don't enjoy tight shots, eat your bricks if you want hair on your chest" posting is a giant turnoff, and it crops up in every Houdini thread. Ease off the hard sale, if you like then just say so. Insulting people for not sharing your taste is a great way to make sure it stays that way. I played it at TPF 2017 & 2018 and really enjoyed it. The build quality was great and I enjoyed the light show, art, theme, etc. It’s on my radar definitely, but I would absolutely pick it up second hand. The turnover rate *does* seem higher than normal, but I don’t think it’s a turd by any stretch of the imagination. I am keeping my eyes open for a Houdini. I think it's a fun game and would love to pick one up on the cheap. $5100 is pretty cheap for HUO. low plays. That one is already sale pending and hundreds of miles away. With some luck, the price will fall a little more and be closer to home. I wouldn’t mind having one. Because the price is dropping, guys are trying to get out before it hits bottom. This game only taught me one thing. Play Before you Buy! I have bought over a hundred games in my time in this hobby but This one reminded me of Why you shouldn’t buy first. Tough and costly lesson. Luckily I got out before the market read the verdict lol. I believe my old game has made it through 3 owners already. I can appreciate this....yet have to disagree. I also bought prior to playing. I honestly couldn’t be happier. Would this be my “one and only” pin? Probably not. But sitting in my lineup I think it fits perfect. Something unconventional next to some easier machines. My family loves it, and I don’t just say that. It is a lot of fun from top to bottom. I really like a dialed in Avengers so am looking forward to playing and maybe buying Houdini at a bargain price. The reviews are too mixed though to buy one cold. +1, I still enjoy mine very much, however there are still many adjustments I need to make on it, and just haven't found the time. (and im not talking about the trunk, my catapult and trunk have worked flawlessly since day one.) I need to make the pops more sensitive, they seem pretty dead compared to other machines. I love the light show, sure the animations could maybe use some work, but the code updates have just made the game better and better!! So many factors. I think all above are valid. From the market drop and people getting out, to just being out of space to it being to tough for some people! I personally really like it. Don’t know if this is good or bad but I think it just takes time to get a feel for the pin. When I first picked it up i had doubts the first 2 games I played. After about 10 or so my shots started falling in line. Then it was a blast. I’m an average player and can blow it up. Modes are fantastic and unique. Really pull you in. American Pinball's customer service has been outstanding. This is will end up being a collectable game as production stopped at 500 games. If you were closer you’d be more than welcome to come try it out!! If you’re ever in Detroit area and have a passport!! Me too. I don’t really care about getting my money back if I ever care to sell. Is that what it is, 500? I never even knew how many were made! Lol - good thing it’s not 600 like Munsters - only teasing. I agree. Probably best suited for the home environment to be honest. Once you “get” this pin it is super cool!!! Speaking as a mediocre player, Houdini is a tough game (and yes - I think the inner lane shot is tight). I love mine though! As far as why so many others are up for sale? Must be looking to buy an Oktoberfest! I know I hope to. We liked the graphics, the cabinet and artwork, and even the playfield is nice, but thought the game play was just so slow and it just wasn't...fun. To me it seemed more like work and solving a crossword puzzle than entertainment. My wife and I both played it and it will never be joining our home collection. Sorry to take this thread on a slight tangent, but I am considering purchasing an Oktoberfest at Allentown or sooner, and I wonder what Houdini owners think about the quality of heir machines? Definitely. No pin is for everyone and most people prefer a little variety. I wouldn't want all pins to be easy nor do I want them all to be gut punchers. I've only played Houdini around 10 times. I really enjoy it but still hard to form an opinion on it. Shots are difficult. Makes me think of the mode start shot on my Shadow. I can sometimes go a whole game without being able to make that one shot. That's not fun. That challenge does bring you back, though, and forces you to work on your skills. If you can get one for $5100, that's really tempting. Pin is gorgeous and loaded with features. Problem is that I have limited space/funds and there are so many great games out there right now. Local op who runs an hourly rate place with 60+ pins has one. When new games come in they are set to coin drop. Direct quote from him: "Nobody played it when it was on coin drop and it's still barely getting any plays now that it's in free play." I am a decent shooter, and can usually blow up any machine given enough time and plays. Of all the recent machines that I have tried and tried again to like, Houdini just doesn’t do it for me. Even after finally putting up a good score, I was left feeling like I had been standing in a semi circle letting all my friends kick me in the nuts, instead of that, slightly knee shaky, high heart rate, adrenaline crashing rush you get from stoking a 1.33 billion game on Monster Bash. This is why I will not own a Houdini. But I will probably get to play plenty of Houdini this year if the one or two machines that will be swirling around our pinball league collective stays put in one persons collection long enough. Yikes! Perhaps you're nudging too hard.